Seriously easy to make, seriously delicious to eat! 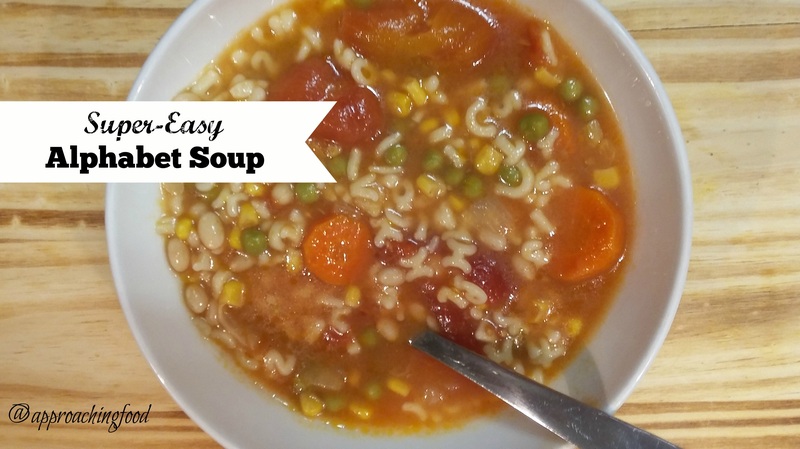 This week’s recipe is Super-Easy Alphabet Soup! I made a batch a few days before I went into labour, so you know it had to be easy to make as I was all out of energy at that point. It was so super easy, and also super delicious! Even the DH, who is somewhat souped-out at this point, really enjoyed it. And did I mention that it’s super nutritious too? Basically, it’s all the things. The easiness of making it totally belies how tasty it is. So you totally should make it! I came up with it after looking at other alphabet soups, and just from knowing how to make a soup. For most soups, you want to make a nice base of sautéed garlic and onion, and then you add in your other items. So, that’s what I did! It’s fun to experiment in the kitchen! I put in more alphabet pasta than most alphabet soups call for, but then I like my letters in pasta form. You can put in less, or the same amount. Make it your own! You can also toss leftover veggies in here too; it’s a very forgiving soup. But if you want to make it exactly as I did, here’s the recipe! This super-easy soup is also super-tasty! You can amp up the veg factor by tossing in leftover veggies, or just make as is. Also freezes well! Peel and chop the carrots into coins. Chop the onion, and mince the garlic. Saute the carrots, onion, and garlic in the oil until the onion is translucent and golden. Add the water, bouillon cube, and (rinsed) soaked beans. Bring to a boil and boil for 15 minutes. Add in canned tomatoes (roughly chopped), peas, and corn. Cook on medium heat until beans are done. When beans are almost soft, add in pasta and cook until beans are totally done, and pasta is soft. I have to say, I made the recipe a teensy tiny bit differently — I cooked the whole soup, but left out the pasta. Then, I turned off the heat, added the pasta, and left to run errands for a few hours. When I came home, soup was done! In other words, it really is a forgiving soup. It’s sort of like a minestrone, but with alphabet pasta. And that’s just plain fun, yes? The soup stays well, and leftovers the next day are yummy. The pasta was fine and didn’t dissolve or over-absorb liquid. It really was an easy and delish soup to make. Highly recommend! Next Post: I’m thinking Apple Pie with Shortbread Crumble. Sounds yum, yes? This entry was posted in Soups on December 2, 2018 by Margaret. My kind of soup – lots of veggies, something to bulk it out – and very forgiving! After our lovely mild Sunday it is supposed to get quite cold again this week so a pot of soup is definitely on the books! Veggie soup is perfect on a cold winter’s day, isn’t it? And the easier the better! It was indeed a nice Sunday, but yes, a colder week is in the forecast! That looks really good! I think I might even have some gluten-free ABC’s out there in the garage. Your recipe has inspired me to go check! Awesome! So glad you’re going to try it, and I had no idea that gluten-free alphabet pasta existed, but glad to hear that it does!